Have you made the faux rotisserie chicken yet? If you did, you can continue with this easy recipe to make your own stock. I also do this same recipe when I’m boiling 6 chicken breasts, but I add 2 tsp. salt and 3/4 tsp pepper and a bay leaf–if I have one. Once you’ve eaten your chicken once, reserve the extra dark/white meat for another use. 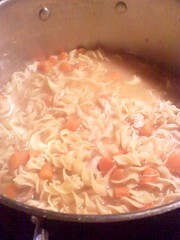 How about chicken noodle soup with the broth you will make today? Or save a handful for chicken flatbread pizza, chicken salad sandwiches or potpie (depending how much you have leftover). This freezes well in a ziploc bag until you are ready to use. 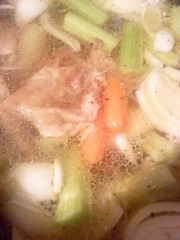 Now on with the broth. Cut up a two carrots, three celery stalks and quarter an onion. You don’t have to peel the carrots or cut the veges finely. You want them to be in bigger chunks unless you are going to use them in soup like I did. You can also puree the veges for deceptive cooking when they are done. Cool and freeze the mixture in a ziploc bag.—00ps off on a tangent. 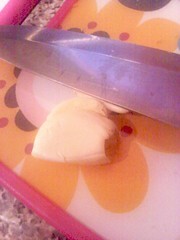 I also add two smashed garlic cloves. I do it by using my chef knife and pressing the blade away from me and applying pressure to the entire clove, skin and all. The skin will easily slip off and the aromatic juices will flow from the cloves. Put this in your broth too. Fill your entire stockpot or crockpot with water and use the bones (which I don’t do), skin (which I do) and some darker meat to give the broth full flavor. I don’t use the bones because I fear choking issues with my children. But Laura does use her entire carcass (nasty word) and boils away. She blends everything in the blender to make a rich, heartier broth. I find my broth to be hearty without the worry of bones in my chicken noodle soup or having to pull out the blender. I cook the broth in my crockpot for 8 hours on low or 4-6 hours on medium low in a stockpot on the stove. Once the broth smell has filled your entire home, making you think you’ve made another chicken, it’s ready. Allow it cool for a while with the lid removed. You want it to be room temperature before you freeze. It’s okay to refrigerate and then do this the next day. 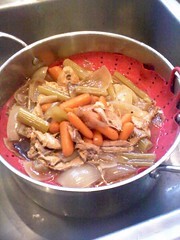 Remove the veges by draining in another pot (use your crockpot or stockpot vice versa) over a colander. I use this silicone one that sets inside my pot. I’m able to reserve these veges for soup or another use. 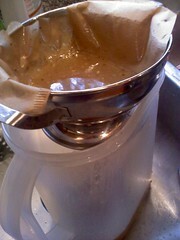 Then I strain the broth into a pitcher using my smaller colander and an unbleached coffee filter to catch more debris. You may have to use a bowl if your strainer isn’t small enough. 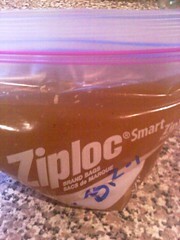 I like using a pitcher because I can pour it directly into my ziploc bags. If you don’t care for the debris floating around, run it through a piece of cheese cloth at this point. It will strain everything out better. 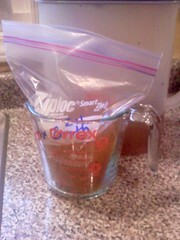 I set the dated and labeled ziploc bag into a measuring cup for stability and then I pour the broth in (about 2 cups) or do the amount you usually use in recipes 14 oz can or 28 oz carton. 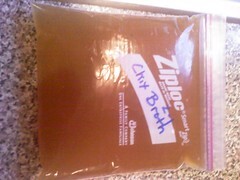 I carefully set the bag on the counter and allow the broth to come to the top and seal it well. It is ready for the freezer. Make sure it lays flat and it will stack well too. 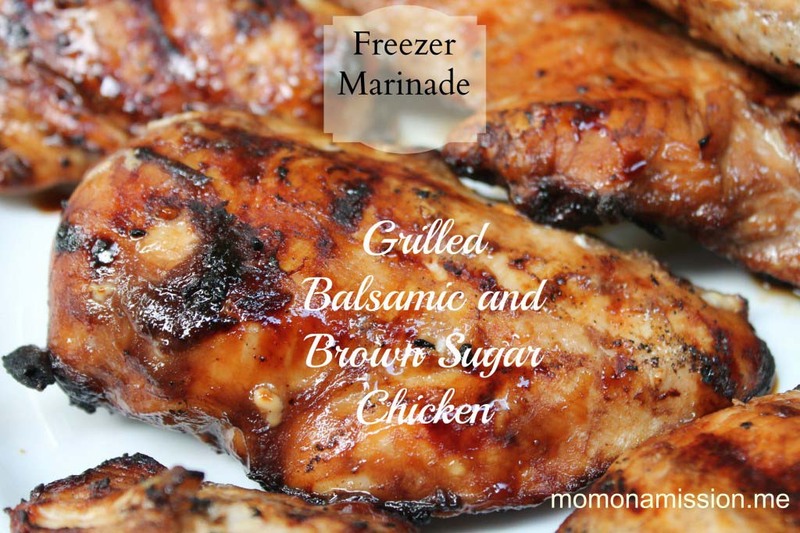 Add this to your freezer inventory. Have you ever tried making your own stock? It’s much richer and tastier than store-bought broth. 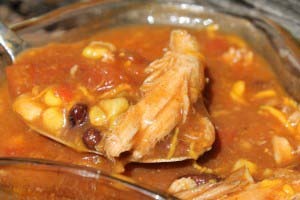 This entry was posted in Poultry and Pork, Soups + Stews and tagged broth, chicken, freezing stock, stock on 02.02.2011 by admin. You mean you’re making chicken stock? Good tips, I just have to get over the bone thing don’t I? I’m just addicted to using freezer bags because they lay flat and store and cut open easily. Are you still getting snow? Yes, I cook chickens and make homemade broth for my family, but I still am vegetarian. Matter of fact we just cooked four chickens today at school and time ran out so I had the pleasure of getting the meat off the bones, must say I am much stronger than I use to be. Say a prayer to get over the bone thing and give it a try, the difference is big with richness. 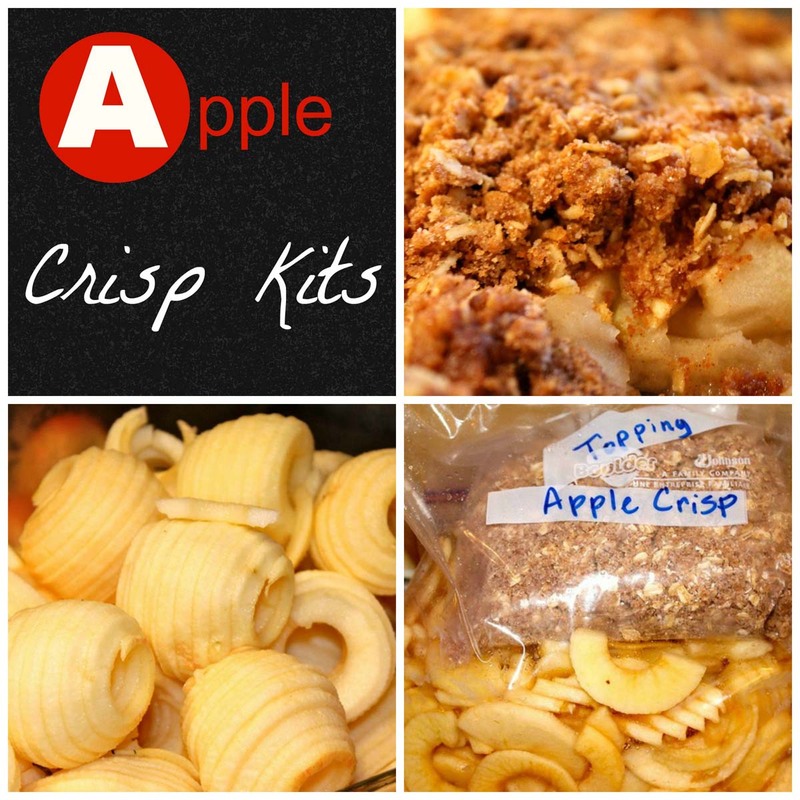 You can still put your cooled stock into freezer bags, I agree about storage being so easy. Also, if you have extra ice cube trays try those for freezeing stock. 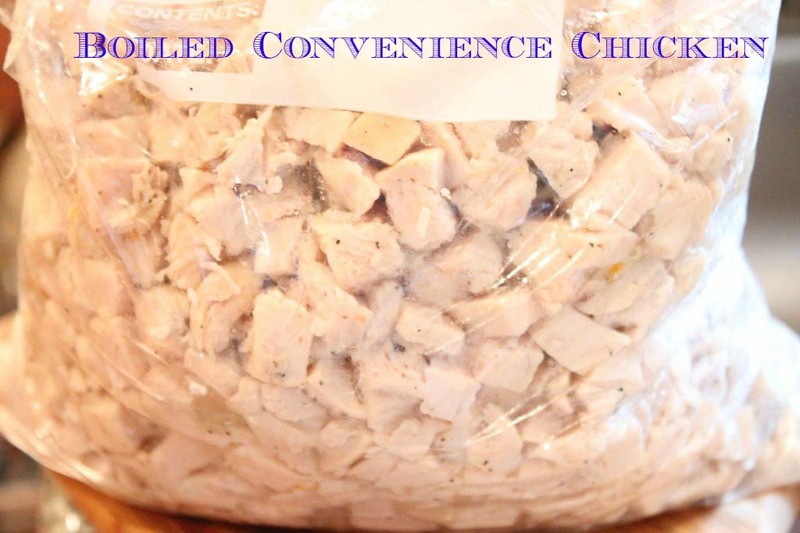 Pop chicken cubes into a zip top bag and you can pull out a small quantity at a time and add to recipes this way. We are snow and ice free but they are calling for a possible storm next Wednesday. Stay warm! I enjoy reading your posts! I make a whole chicken and then broth with the bones. I need to add garlic to mine because something is missing! Fresh garlic is always the ticket! You strain it twice, right? 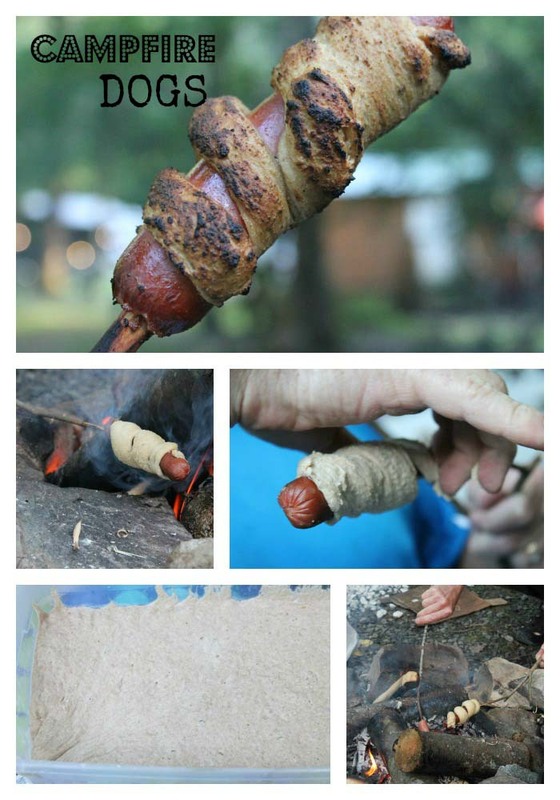 Surely there won’t be bones slipping through your cheesecloth. I actually started using a recycled basket liner inside a salad spinner. 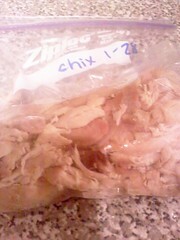 I put a rubber band all the way around and then I can catch more of the gunk from the chicken. And I can make two batches from one carcass. The first I use the carcass only; the second I add the onions, carrots and garlic salt and pepper since most of the flavor is gone from the bones; although I keep the bones. Love your website! I read somewhere that you should cool the stock in an ice bath? Do you think that is necessary? Do you put your crockpot directly into the refrigerator to cool? I’m making turkey stock from my leftover turkey. Thanks! It would help it to cool faster. I leave mine out for a while, up to two hours before refrigerating. It definitely raises the temp of your refrigerator if it’s super hot. I guess the ice bath is preference.